Click here for the Instructor Training School Schedule and General Information. As a Drill Corp Instructor, you will be able to teach Boot Camp Intensive Pool School (BCI), Competition Skills Training Class (CST), private instruction and access to earn commissions from The Drill Instructor products. Owning and operating your own PPYA program will be both rewarding and fulfilling in many ways. However, it is critical to have the right motivation for being involved in such a program as this. If your primary motivation for wanting to be a PPYA Drill Corp Youth Instructor is to make money, you'll most likely not be in business after one year because kids can tell when you really care about them. It's understandable that your efforts should be rewarded. Your financial rewards will come as the result of managing your PPYA program successfully. Leading and directing children and juniors to build their character and pool playing skills requires a sound mind, a good heart, and the discipline and diligence to follow a proven curriculum. *A background check is required and will be limited only to having no sexual offense charges currently against you or history of sexual offense charged against you or any member of your household. The financial rewards for operating a PPYA program are healthy. The actual details for these numbers will be learned during your Drill Corp Youth Instructor Training School. The following financials are hypothetical for this presentation only, but realistic based on the operation of previous PPYA programs. The total investment to operate a Certified PPYA location as a DCY is $7,500. You will be required to pay $1,500 of your total investment to attend the Drill Corp Youth Instructor Training School. 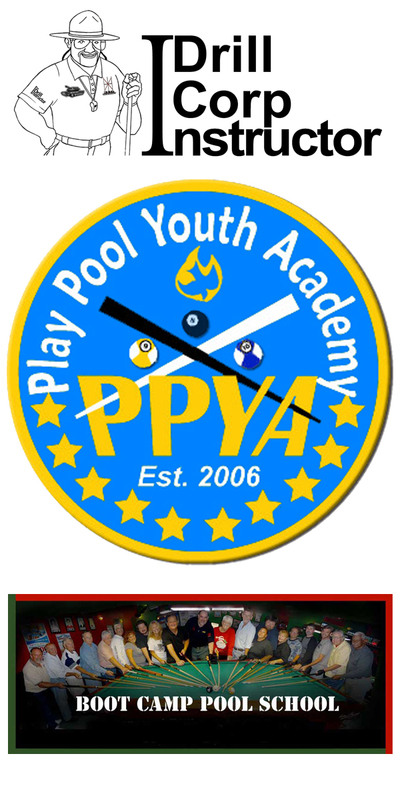 The balance for the PPYA Certification will be paid out of the revenue of your PPYA operating budget over two years ($250 per month for 24 months) interest free beginning 60 days after your PPYA is operational. There is no financial obligation for the balance of your PPYA fee if your confidential background check does not clear or, if at any time during the twenty-four month period you become incapable of opening and operating your PPYA location. A new financial obligation will be arranged between a qualified DCY for your PPYA if that DCY takes over your PPYA location. • You don’t need to bring any class materials; we’ll have it all here for you. • You’re welcome to bring LapTops, Pads, etc. • You're welcome to ship your equipment ahead. • Suggested dress is the same as you would play a tournament final. • Lunch is provided at the Instructor's school. On your own for dinner. • Attending Days 1-3 is mandatory. Only PPYA Instructors attend Day 4 and 5. • The class time flies by FAST! You will be challenged. Register for the next class by completing the registration form above and paying your Instructor Training School fee.